CONCERT AT WIEN MODERN NOVEMBER 27TH! BOA Morten Barrikmo, clarinets Tanja Orning, cello Tora Augestad, voice On their genre-defying debut album mOOn Over tOwns, the trio BOA interpret specially commissioned miniature compositions by a number of Norway"s leading composers and songwriters: Susanne Sundfør, Ole Henrik Moe Jr, Christian Wallumrød, Eivind Buene, Jenny Hval, Evan Gardner, Jarle Bernhoft, Hanne Hukkelberg and Morten Qvenild. 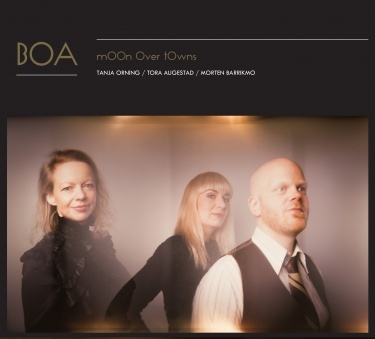 The trio BOA was formed in 2006, and the current members of the ensemble are Tora Augestad (vocals), Morten Barrikmo (clarinets) and Tanja Orning (cello), all of whom are prominent and high-profile performers of contemporary music in Norway and abroad. All three musicians also have extensive experience playing classical music, jazz, pop and rock. In 2010 BOA initiated the project "Max 3.30 Pop goes avantgarde/avantgarde goes pop", in which they invited a number of Norway"s foremost composers from different genres to compose "pop songs" for the trio. The result is a successful combination of lovely and eccentric songs which both belong to and are alien to the two genres. "Part of what is exciting about this project is how the assignment has been interpreted in the light of who we are and who the composers are," say the trio. The pop composers have had the opportunity to experiment within a contemporary musical soundscape, and the so-called art composers have been "allowed" to create a pop song. Several of the composers have been adventurous in their choices. What they have in common is that they have all accepted the challenge of exploring unfamiliar territory. Susanne Sundfør"s contribution to the project, "Last Thoughts at the Stake", was later further developed into what would become the title song of her album The Silicone Veil, and Jenny Hval"s "Engines in the City" became the opening song of her critically acclaimed album Viscera in 2011.